NEMO Blaze 1P Footprint. When it comes to tent longevity, we've got you covered. The Blaze Footprint is not for waterproofness; NEMO floors already are impenetrable to water. Rather it protects your tent floor when camping on rough surfaces, adding longevity to your tent. 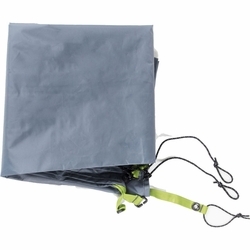 Made of 70D PU Polyester, it stands up to gravely and sharp surfaces that can take a toll on your tent. It packs small in an included breathable mesh pouch with a drawstring. 70D PU Polyester is durable and resists wear from sharp and gravely surfaces. Waterproof to keep the bottom of your tent from getting wet and dirty. Attaches securely to the Blaze at perimeter points. Sized to fit underneath tent without being visible. Included mesh bag with drawstring for storage and transport.